← Cinco de Mayo 2014! I made these bacon dark chocolate mini cupcakes for my mother-in-law last weekend on Mother’s Day. She loves dark chocolate so I though that that she might enjoy these cupcakes. You could also leave out the bacon and you’ll get a really nice intensely chocolate-y cupcake! Here’s 13 mini bacon dark chocolate cupcakes for my mother-in-law! It’s her favorite number. Remember Walter Mitty’s Clementine Cake? My mom loved it so much so I made some clementine cupcakes! One recipe makes about 24 regular-sized cupcakes. For these dark chocolate cupcakes, it is a pretty standard cake recipe in which you mix the dry ingredients separately as I have in this photo. Then mix together the wet ingredients in another container or vice versa. Then mix the wet and dry together! Easy peasy! I’ve done both a regular all-purpose flour based cake and a gluten-free version and I provide both measurements in the recipe below. 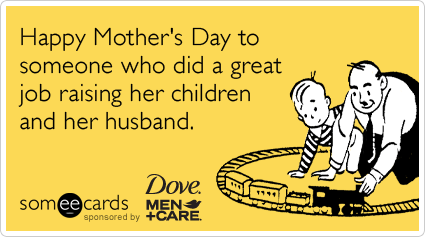 Fill up your tins! I filled this batch of cupcakes a bit much. You can kind of see that they a bit overfilled in the finished baked product. A bit of a muffin-top situation. Why are these cupcakes tilted? Well, I’ve seen several King Arthur Flour recipes (such as this muffin recipe) that suggests that cooling while tilted helps prevent the bottoms from steaming and becoming soggy. I think that as along as you cool it on the wire rack tilted or not, they’ll be fine. This time I filled the tins 3/4ths of the individual cups and they are just right, though the muffin tops with those crusty edges are pretty tasty too! Heat oven to 350 degrees F with a pan of water on the bottom shelf. 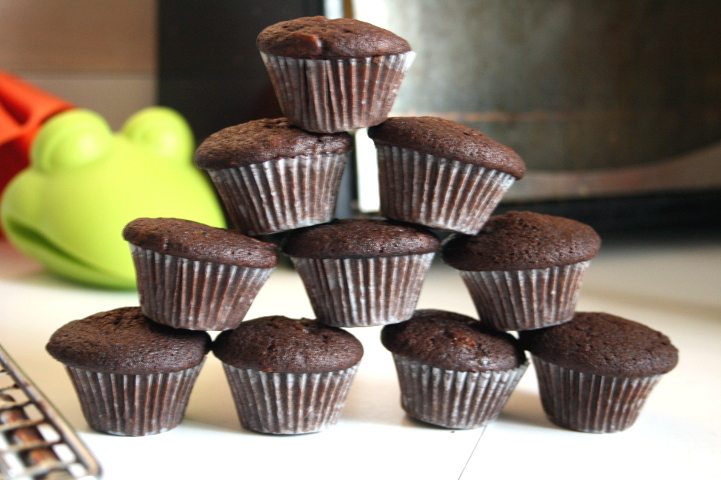 Line each well of a mini-cupcake pan with paper liners. Lightly spray with oil. Dry-ingredients: In a large bowl, sift together the flour, psyllium husk, flaxseed, cocoa powder, baking soda, and baking powder. Stir in the mini chocolate chips. Break bacon into ~1/2-inch pieces and mix 3/4 of the bacon crumbles into the rest of the dry ingredients. Wet ingredients: Using an electric mixer, whisk the eggs, sugar, and oil for 5-7 minutes until light and slightly fluffy. With the mixer on, gradually add the cold espresso, vanilla, maple syrup, and buttermilk. Mix until combined. With the mixer on medium-low speed, add the dry ingredients to the wet ingredients. Mix until just combined. 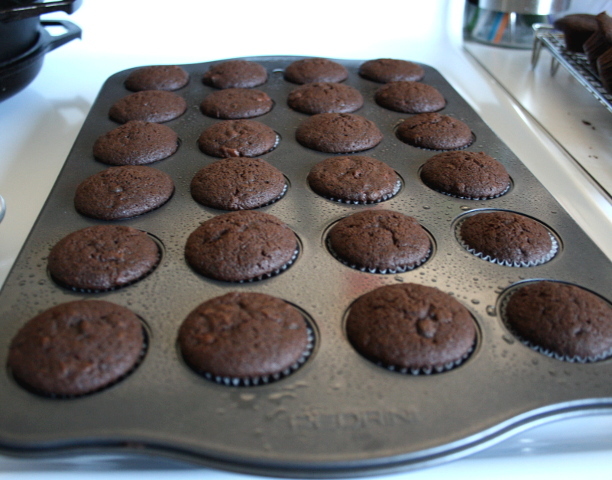 Pour batter into the paper-lined mini-cupcake cupcake pans 3/4 full. 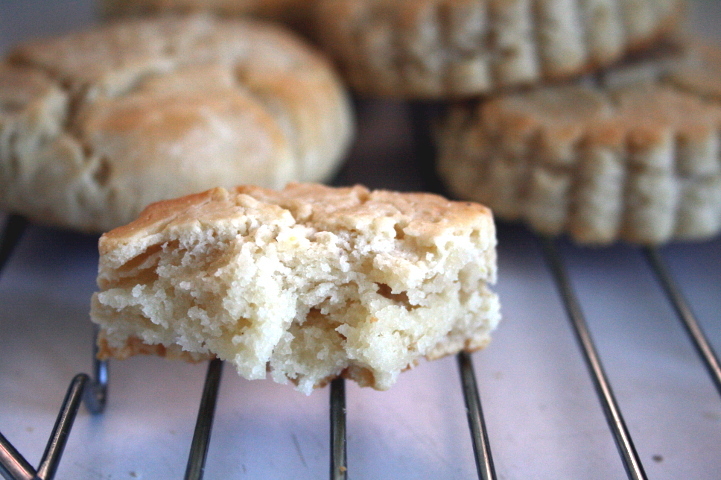 Bake for 10-15 minutes or until toothpick inserted comes out without any crumbs. Let cool on wire rack. While cupcakes are cooling, make ganache. Ganache: Place chocolate in a metal or glass bowl (something heat-proof basically). In a small saucepan, heat the cream and maple syrup on medium and bring to a simmer. Pour the heated cream onto the chocolate and let sit for 5 minutes to let chocolate soften and melt. Stir in the butter until smooth. 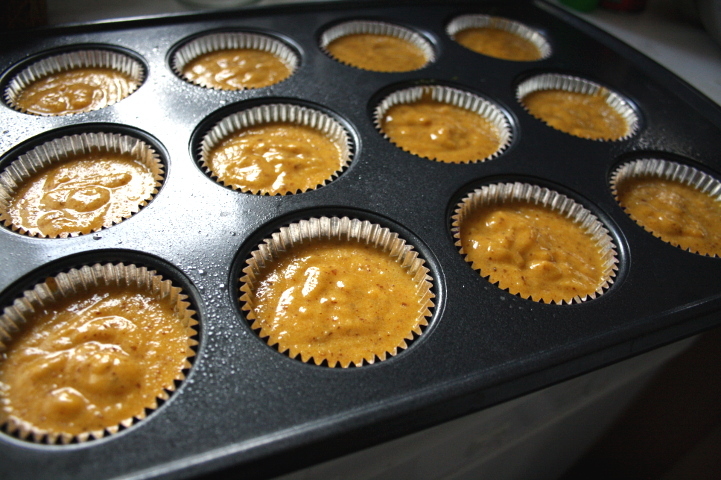 Let cool slightly before using on cupcakes. 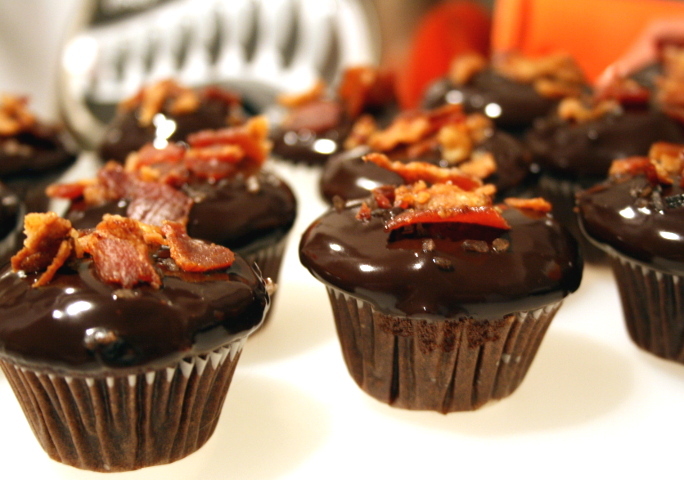 When cupcakes are cool, dip the tops of the mini cakes with ganache and garnish with remaining bacon. This entry was posted in Baking, Food, Gluten-Free, Holidays, Recipes, Snacks and tagged allrecipes.com, bacon, Cake, chocolate, Cupcake, Flour, ganache, maple syrup, mini cupcakes, Mothers Day. Bookmark the permalink. ALL THE BACON! these look awesome Samantha! And I spy your lovely seafoam green kitchen aid. jelly. Thanks so much! 😀 The kitchen aid was originally my mom’s, but she prefers hand mixers now so she let me take it. It is the smaller artisan model, but I might get the bigger one someday. Looks delicious minus the bacon, but I’ve been told bacon makes EVERYTHING taste that much better.